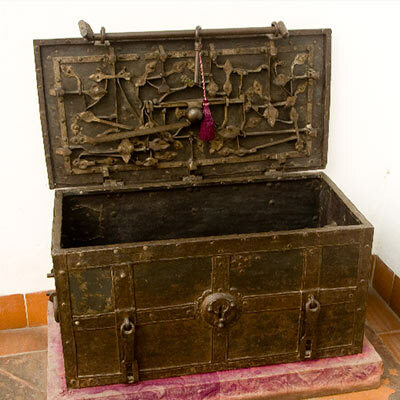 The collection of personal property of Viana Palace is quite heterogeneous because of its origin, since it feeds from the rich heritage of noble families as were the Villaseca and Saavedra. The germ of what is now the museum collection was created under the protection of José Saavedra y Salamanca second Marquis of Viana, with the idea of creating a museum in his home as a symbol of family and personal prestige. Initially, his goals were to show the collections most closely linked to the aristocratic family, exhibiting everything related to the nobility, while enhancing collections of craft works representative of the city of Córdoba. The most important transformations began in the palace in 1918 with the idea of carrying out the project. Don José Saavedra, man of fine taste and artistic sensitivity, is who personally oversaw the refurbishment of the palace and who looked after getting an appropriate framework to exhibit his works. While most of the increase of the collection was due to the contribution of the third Marquis of Viana Fausto Saavedra and Collado, married to Sophia of Lancaster and Bleck, who in 1956 sold the Viana Palace of Madrid to the state, to transform it into the current headquarters of the Ministry of Foreign Affairs, as a result he moved its artistic heritage to Córdoba, bringing together the whole arrangement of furniture and carrying out the last refurbishments in the building to accommodate all the goods. The inside of the house remains configured as when it is visited today. 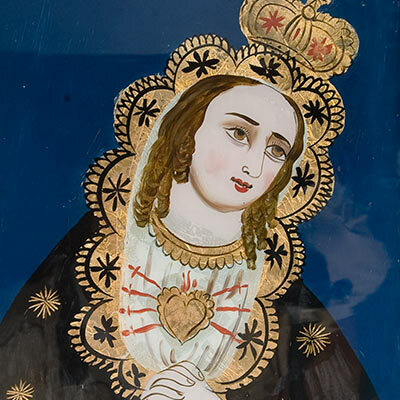 Considered as one of the best collections preserved in Spain, it was compiled by Don Francisco Rafael de Uhagón y Guardamino, Director of the Academy of History and Marquis of Laurencin, and sold to Don José de Saavedra and Salamanca in 1926. 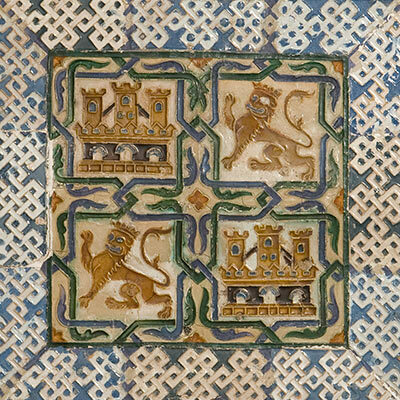 With over 300 pieces, a sample of the tiles from the 13th to 19th centuries is exhibited, but the fundamental issue is the noble heraldry, the collection also includes a large sample of guild heraldry, some street signs, bullfighting scenes and floral motifs. The collection exhibited at the Viana Palace of Córdoba is one of the most comprehensive, valuable and representative samples of former Cordoban leather available today, it was bought by Don José Saavedra in 1926 from Don Anastasio of Páramo, it exhibits thirty pieces formed from embossed and Cordoban leather, typical work of the city of Córdoba belonging to the 15th, 16th, 17th and 18th centuries. Used in the art of defence and attack in duels and in the last third of the 19th century as a sport. 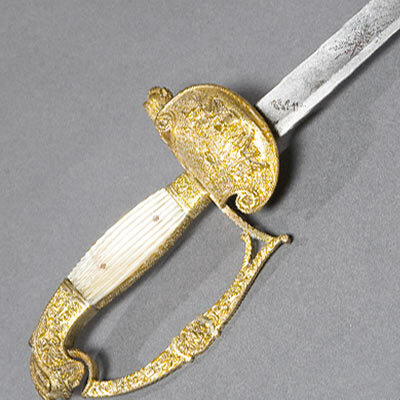 The extraordinary collection preserved at the Viana Palace is made up of 19th and 20th century swords, sabres, and foils; gird swords and sabres predominate, with Toledo, French and German blades. Their handles show fittings with period features. Swords, made from shell with rich styling and some in cross. The sabres, with guards, stirrup and two or three quillons. 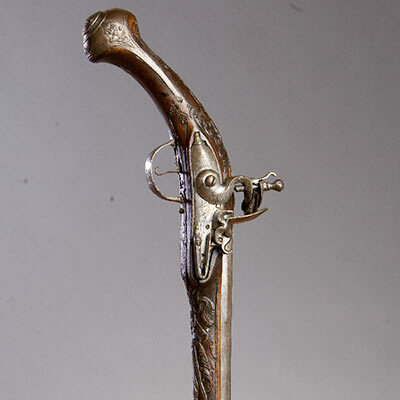 The bulk of the firearms collection is made up by 24 arquebuses made by the royal arquebusiers of Madrid between the 17th and 19th centuries, weapons that were used in great hunts. The first were adapted in the 19th century to the new firing systems. Their guns are 2 or 3 orders, mounted in the Spanish style, with damascene gold decoration. 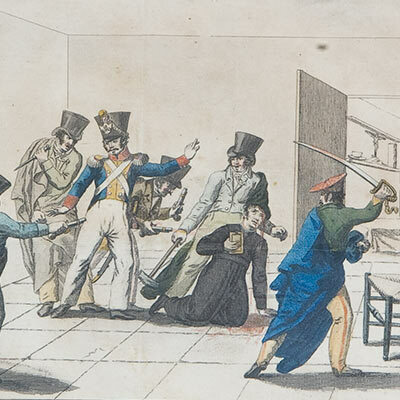 The collection of pistols for personal use are completed by those for duels, revolvers and a musket. 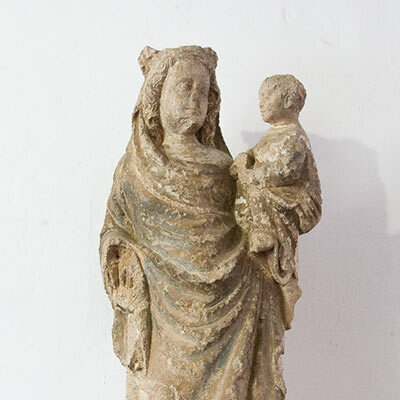 It is considered one of the most important private collections in this area. 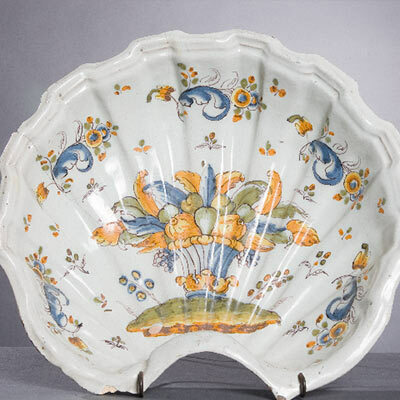 The collection of ceramics from Viana Palace, has a large number of pieces and representing different Spanish potteries, such as those of Talavera, Levantine and Andalusia. They show a wide selection of “coarse” pots and hand-decorated tiles stamped either in cobalt blue or polychrome, for household and ornamental use. Similarly French and English chinaware is represented, among which include a collection of jars with metallic reflections. More than twenty of this type of furniture from the 16th to the 19th centuries make up the Viana collection, this diversity allows us to observe their evolution and classification. 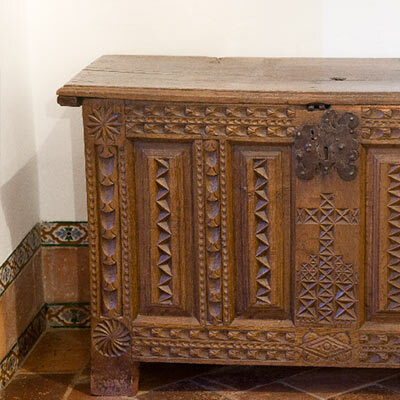 According to their support we have preserved those of: pie de puente (chest of drawers), taquillón (small trestle table), and table with fasteners. 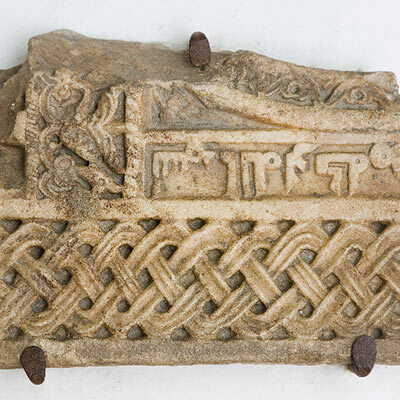 The decorative repertoire is extensive and consistent with the period and place of origin. Undoubtedly one of the finest private collections preserved in Spain. The Archaeology collection, exhibits most of its pieces in the courtyards, it takes us on a tour of the different cultures that have preceded us, showing us from simple Neolithic polished stones, to more elaborate ones from the Roman, Visigoth and Arab periods where a wide variety of pieces, most of them from architectural origin and some ceramics of domestic use. The Viana Palace furniture shows us a rich variety of styles from the 16th to the 20th centuries, numerous well-preserved pieces bring together usefulness, with beauty in their designs and proportions. Seating furniture, tables, chairs, chests and desks are the most abundant, made with the use of rich materials and different construction and decorative techniques. 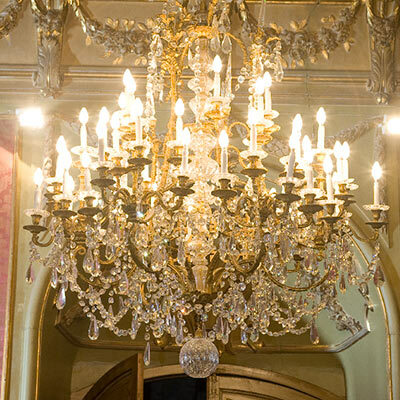 The collection featured in Viana Palace has a rich repertoire of pieces such as: lamps from La Granja, Baccarat and Bohemia. An important chapter is made up of more than 140 pieces of opal used in both functional and purely ornamental objects, among which are pieces dedicated to tableware and vases in different shapes and sizes. This collection is made up of pieces which are ornaments and tableware, dating from the 17th to 19th centuries, an important place is that occupied by Chinese porcelain, showing the high level of quality and creativity that these artisans achieved that rivalled the Japanese, present in the collection with some pieces of the so-called Imari style. 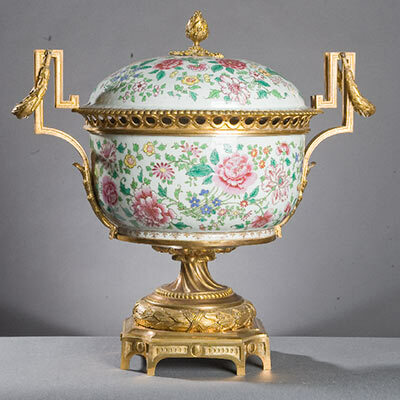 European porcelain also has a broad representation with pieces of English, French, German and Spanish origin. 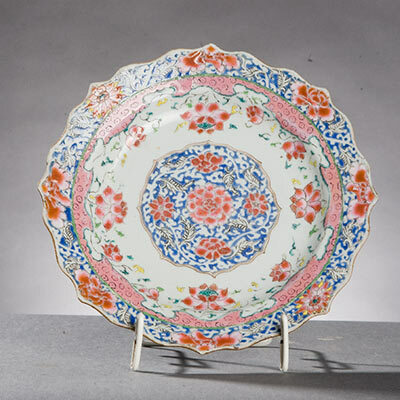 A collection of tableware is exhibited in 11 display cabinets, from Chinese and European porcelain factories, dating from the 18th to the 20th centuries, decorated by hand with different motifs: we have beautiful examples in tableware with polychrome with place settings belonging to the “pink family” and monochrome with decoration for the place settings in cobalt blue. Similarly European porcelains have an excellent representation with pieces decorated by hand, the most represented come from factories in: Vienna, Berlin, Meissen, Bohemia, Old Paris and England. A large number of works with varied subjects and supports form this collection, whose chronology goes from the 16th to the 20th century. The most represented are the Spanish and Flemish schools. 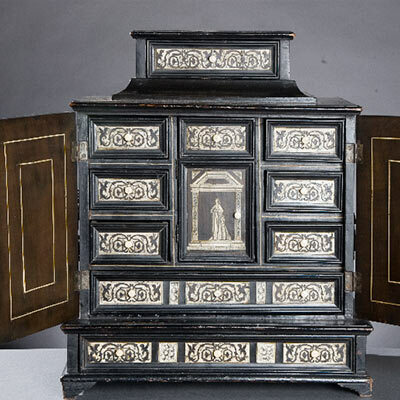 An interesting section is made up from the documentary miniatures that enrich the latent letters of nobility, exhibited in display cases in the leather gallery. 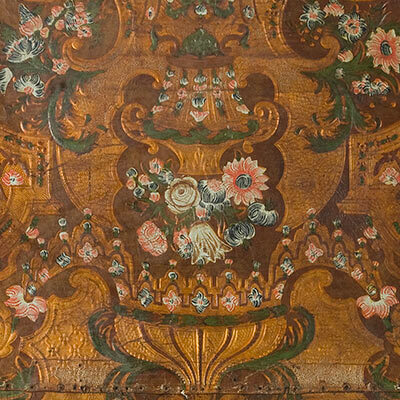 The fabrics are present in almost every room in the house as a decorative or functional element, which is why we find a very rich collection in this material, with a chronological overview of the 16th to 20th century. The sample includes: tapestries, coats of arms, carpets, luxurious upholstery, and even garments worn by the entourage as a symbol of noble lineage at the time. 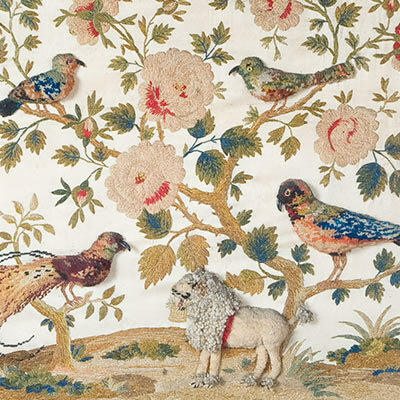 The tapestries have samples from the Flemish factories, the French ones of Aubusson and Gobelins and Royal Spanish factories of Santa Barbara. In the carpets section there are examples from various sources with techniques of warp and knot also preserved, predominantly Spanish, Persian carpets and a set of Kilims with Turkish origin. 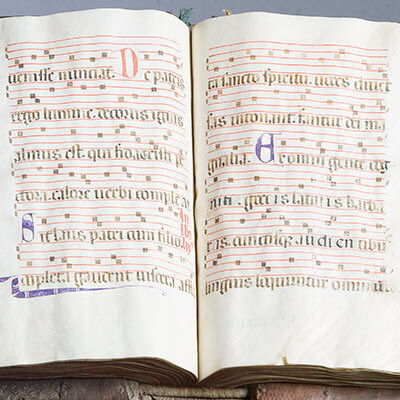 An attractive collection of nine choir books from the 17th century, in excellent quality and condition are kept in the Viana Palace. 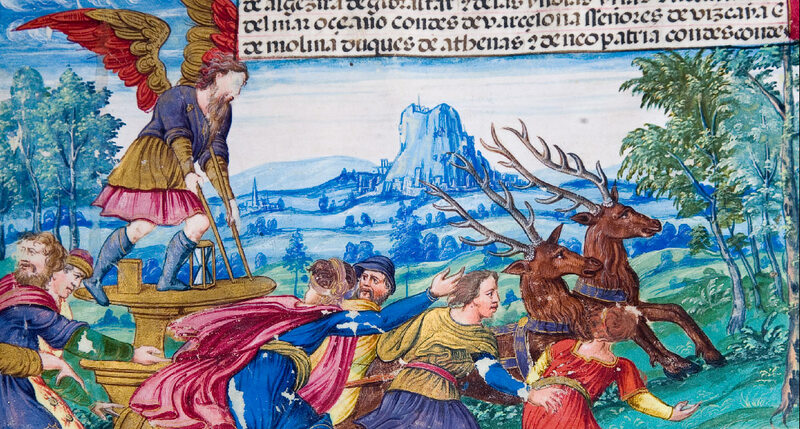 Their parchment sheets, with scores handwritten in two inks, trimmed in leather with brass corners and clasps and some of their pages with beautiful polychrome miniatures. The serial art so characteristic of the 19th century, has interesting specimens in this collection, including drawings illustrating the engravings of French and Spanish origin, the subject most represented is the history with series on: Francis I, the Napoleonic Wars, Portraits of illustrious men and maritime Episodes. The religious theme is occupied with prints with representations of figurative character, papal bulls and prayers. The English sample shows mythological subjects with a series of engravings of the Muses, dated around the late 18th century. 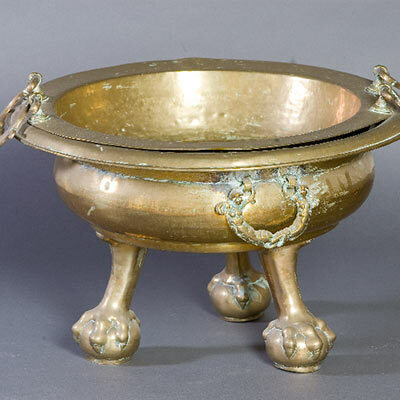 The set of pieces made of this metal groups different collections highlighting some very valuable pieces such as: sculptures, chiselled dishes, writing desks etc. 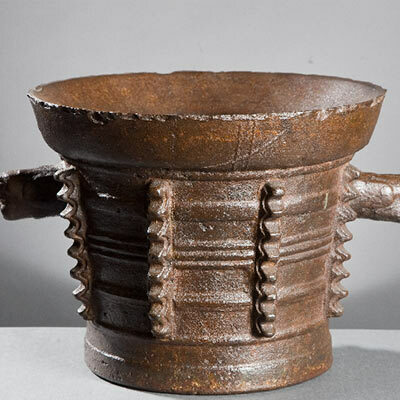 However, most of the pieces in this section could be fitted within popular culture bringing together a number of very significant pieces that transmit customs, traditions and lifestyle to us. The collection of copper in the Viana Palace consists of very ornate decorative objects and numerous pieces that speak of lifestyle as they are traditional pieces. This element, while endowed with ductility and strength, is suitable for the manufacture of many objects, as well as reinforcements, embellishments and support of others. The collection includes various objects: ceiling lamps, wall sconces, candelabra, chandeliers and candlesticks, pedestals, chests of different sizes, scissors, lecterns, fireplace hanging hooks and utensils. Similarly there are many pieces of furniture that include some element of iron such as: locks, fittings, plates and fastenings. This collection brings together pieces with a broad chronology from Roman times to the 20th century. Its pieces cover virtually every style, appreciating in them a great variety of materials: wood, bronze, porphyry, terracotta, plaster, ivory, limestone, ceramic, porcelain and glass. A set of pieces preserved in the Viana Palace deserve special attention such as: a dozen jars of 19th century English pewter, a material similar to silver that has been traditionally used in the manufacture of objects for ornaments and household items; the collection of candelabra made up from twenty pieces from the 17th to 19th centuries; one hundred and two candlesticks from the 17th to the 20th centuries with very different styles and materials; thirty-six highly decorative trays with oriental decorations; lanterns and various objects made from tortoiseshell such as reliquaries and caskets make up endless articles of extraordinary wealth.